The Writer and Producer is Robin Mitchell. He has written one novel, Grave Robbers , the top selling guide book What's Under the Kilt? 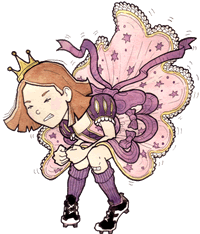 and the children's book Princess Pumpalot: The Farting Princess . Robin, who co-founded Edinburgh's walking tour company, The Cadies & Witchery Tours, has been a partner in this successful Edinburgh business since 1984. Robin is also Director of Cadies Productions Ltd. His film credits include And So Goodbye (2004), The Rest is Silence (2005 BAFTA Scotland nominated), Breadmakers (2007 BAFTA Scotland nominated), William McLaren: An Artist Out of Time (2010), About A Band (2010), The Download Horror (2012) and A Tale of Two Syrias (2012). Robin's play, May I Have The Bill, Please? was performed at The Boards, Edinburgh Playhouse as part of the 2015 Edinburgh Festival Fringe and after a successful run, the play returned to the Fringe in 2018, this time at Le Monde in George Street. The second Princess Pumpalot book entitled Princess Pumpalot: The Super-Farting Bean Mystery was published in July 2017 and a new show Princess Pumpalot: The Ghostly Farting Monk Hunt will be performed at the 2019 Edinburgh Festival Fringe.